The Tunturi T40 treadmill is made by the Finnish company which has been around for over 80 years and has been well known in the business for their high performance fitness equipment. This model doesn’t look like any treadmill you’ve seen before in North America since this European manufacturer prefers an uncomplicated design. But the technology under the hood is highly advanced. Tunturi treadmills have been praised for their mechanical quality in the past yet were still knocked for the outdated, old-style displays; that has all changed with their latest models. Trainers and experts give the Tunturi T40 treadmill excellent marks for its solid feel and construction. These are long-lasting treadmills which is evident from their multi-year warranties. Like its more expensive sibling, the T85, Tunturi’s mid-priced T40 model comes with advanced features such as the patented T-Scale™ programming which allows the user to adjust any of the programs to a lighter or more intense level with just the press of a button. UPDATE: The Tunturi T40 treadmill has been discontinued. 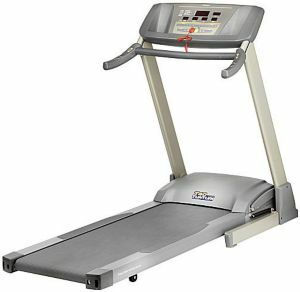 Check out the newest Tunturi treadmill models on the company's site. Consumers like that there are hot keys located in the gripper bars for quick changes of the speed and incline during manual and programmed operations. Another interesting aspect of this programmable treadmill is that the user can input literally thousands of profile variations. Potential buyers are cautioned that the Tunturi T40 may look “cheaper” than American treadmills: the console appears simplistic yet be assured it delivers a constant updated display of your progress. Are the Finns small people? We aren’t sure why the Tunturi T40’s top user limit is 300 lbs because we feel like such a solid machine can handle more than that, and the running deck is huge. At $1999, this machine is a strong competitor to other treadmills in its price class. The Tunturi T40 may lack the bells and whistles of other treadmills but the manufacturer delivers on the frame, motor, parts, electronics and the intelligent interactive features. If you’re looking for a quality machine that will give you years of use with regular maintenance, check out the Tunturi T40 treadmill.